We left home early to drive to Linn of Dee, stopping briefly at Inverey to say hello to Huff n Puff booting up before heading down Glen Ey. Devil's Point had been at the top of the list for whenever the weather looked best in the east and MWIS had said 70%, although at the last minute that dropped to 60% - but it was still significantly better than the west. So Devil's Point it was. We briefly considered approaching from the north (which would have been a shorter drive) but for us the southern half of the Lairig Ghru is the more attractive half and we were keen to see how the trees had recovered in Glen Luibeg since we saw and reported a forest fire there in 2014. It was another beautiful morning, very like when we climbed Derry Cairngorm, and as we walked we recalled what had happened that day. A bike overtook us, the first of several. We figured from the lack of rucksack the lady cyclist wasn't heading for the hills and a few minutes later we passed her sitting by the track. "I'm waiting for a Duke of Ed group" she said and related what had happened the previous day with navigational errors taking one of the groups off course meaning they were very late and very tired. We wished her a good day and walked on. About 15 minutes later we met a group of girls with large packs, looking weary, one sporting a burqa style midge net. We asked how their night had been and they said "wet". We told them the forecast was better for today and BBC Weather said no rain until 8.00 which upbeat news produced some smiles but unfortunately it turned out to be untrue when it started raining about 1.30! We were passed by another couple of cyclists heading, as we were, for Corrour bothy. We were the only people we met all day who were doing this route without a bike. We passed boarded up Derry Lodge and Moira commented it was a shame this building couldn't be used for something. A few minutes later we read a notice to the effect that planning permission is being requested to do something educational with Derry Lodge. So that's good. In several places new signs had been erected stating there should be no fires in the Mar Estate. They were in addition to the ones we saw two years ago on the day of the fire. We crossed the bridge at Derry Lodge, replacing the one that was washed away in the floods, and headed over a wet area, the one part of the Lairig Ghru path we were on not up to the standard of the rest. When we reached the area near to where the fire started (because campers had failed to ensure their fire was properly out) we stopped for a snack as it was a long time since we'd left home. This gave us a chance to have a good look at the affected area and we remembered watching the helicopter dousing the smoking, blackened ground with bucket loads of water collected from a lochan in Glen Derry. Nature makes a good recovery after fire and a casual observer might not see anything amiss. But we could see trees that should be green, looking dead, or not as healthy as they should look. One of the problems was the fire had gone undergound and smouldered on for days destroying roots below the surface. As we neared the Luibeg Burn we decided to stay on the path to have a look at the crossing point as it would save the detour to the bridge. Most of it looked fine but at the far side the gap between boulders was wider and the water gushing between was fast and deep. A mistake there would mean wet feet, or possibly worse, so we followed the path along the bank of the Luibeg to the bridge, as we had done before when we climbed Carn a' Mhaim. The downside of this detour is parts of the path back to the main Lairig Ghru path are water-logged and churned up by many boots on mud. It was a relief to be back on the good path again and soon we passed the right fork up the shoulder of Carn a' Mhaim. We knew now all we had to do was traverse round the base of Carn a' Mhaim and round the corner we would see our target, Devil's Point. This section felt a bit longer than expected but I guess it's quite a wide sweep round before heading north into the central jaws of the Lairig Ghru. At last we're seeing what would be my final Cairngorm - Devil's Point! It was a relief to see the bothy as we'd promised ourselves a lunch stop before the start of the climb. We could see three tents pitched close to the bothy and as we got nearer could see three figures sitting by the tents. The area between the bridge and the bothy is boggy and it was helpful to have a path making it a drier passage than it might otherwise have been. We didn't want to intrude on the three young fellows sitting by their tents so planned to go a bit further up the path before stopping, but not before we'd had a look inside the bothy. We stuck our heads in the door and found the place already occupied by an older gentleman unpacking his backpack. We got chatting and he told us he'd spent the previous night in the Hutchison hut, and because it had been a bit of a wild night it became very crowded with other occupants, including a D of E group who had been instructed not to camp in the bothy but to use their tents.... but it had been very tempting for them to spend part of the evening under a solid roof! Sounds like it was standing room only. His plan for the rest of the day was to take the same path we were taking then to head north to Cairn Toul and back. He was busy inflating his mattress and bagging his space on the sleeping platform - which is I suppose the bothy equivalent of going down to the pool early to lay your towel on a sun bed! We left him to his nocturnal preparations and on the way out saw a notice about the number of campers using the area round the bothy posing a health risk so a toilet had been installed. I knew about this having just read Malky's report about dealing with the contents of the toilet - an unpleasant job I'm sure we all applaud him and others for doing! So we started up the path to the ridge and once we reached a decent distance between ourselves and the campers sat down for lunch, reflecting on why fit young chaps would choose to lounge about in a place like this on a day like this. The path was good all the way up. No sooner had we started on the zig zags than a veil of fine droplets crept in around us. You would hardly call it rain, more like walking in cloud, but it was quite wetting for all that so we stopped again to put on waterproofs. I noticed the man we'd spoken to earlier was coming up behind and he too stopped to don the gear. So much for the rain not starting until 8.00 - this was only 1.30! But to be fair that was BBC Weather for Inverey and deep in the Cairngorms has a weather system of its own. We continued on up and I came to a point where the path split, one side continuing steeply straight up and the other making a traversing left fork over the burn. I knew we had to head left for Devil's Point so I crossed the burn and climbed a little on the far bank before waiting for Moira to catch up. This is where I made a schoolboy error. I didn't think she was far behind so when after a few minutes she didn't appear I traversed a bit further to hopefully give me a better view of where she was. This meant that when she reached the fork she didn't see it, or me, and continued on the path straight up which took about 10 minutes longer to reach the ridge and topped out further to the north than she needed to be. From my vantage point further south I saw someone reach the top of the straight up path and shouted - but it turned out not to be Moira but the man who'd been following us, who must have wondered why I was shouting at him! Then Moira appeared and the two of them had a conversation about the path to Cairn Toul as he wasn't too sure where it was. He disappeared into the clag and we hope he got on okay before returning to the bothy later. I was concerned about the cloud covering the north end of the ridge which appeared to be moving our way. I wanted to get to the top of DP before it caught us but it was a mistake not to have waited at the point the path diverted over the burn. I need to remember that one's fellow walkers are not possessed with telepathic gifts telling them which way one has gone! From the ridge there's a pretty clear path through boulders right to the summit. Because of the fine rain I tucked my camera inside my jacket and managed to get one shot of the view including droplets on the lens! It was pretty dreich up top and with little likelihood of improvement we decided we'd head back to the shelter of the bothy for a cup of coffee before the 8 mile trek back to Linn of Dee. We had met a number of folk who had biked part of the way in and some who were camping, but no one else who had walked all the way in and were planning on walking out again on the same day. So a wee rest in the bothy would be a fine thing. We stepped into the bothy to find it occupied by the three young campers we'd seen earlier by their tents. They were sitting in a row on plastic chairs. We reassured them we weren't planning to stay - just in for 10 minutes to drink our coffee and for Moira to apply a plaster to a blister. As my eyes adjusted to the gloom I saw there were another two chairs stuck together beside the three that were occupied so because Moira would benefit from a seat to apply said plaster I picked them up. "That chair's broken" I was informed. "Okay" I said. I then prised the broken chair from its companion, watched by the trio. We later learned they were on a 'rest day' from climbing hills which seemed to entail sitting outside by tents until rain started then sitting in bothy on plastic chairs watching the antics of whoever turned up. Well I suppose with no internet, and entertainment being short, you have to take whatever comes. I gave the unbroken chair to Moira and perched gingerly on the broken one. It didn't strike me then but it did later that it was interesting these three young guys (students - one at Cambridge university) evidently felt there was nothing strange about sitting watching someone old enough to be their granny (who'd just been up Devil's Point in the rain) wrestling apart two plastic chairs, one of which they knew to be broken. so she and her friend could sit down for 10 minutes before the 8 mile walk back to their car, while all they'd done all day was just sit. We chatted away to them, asking what they'd climbed prior to their rest day (we did all the asking so perhaps they weren't feeling sociable), and then we were joined by a young woman from Oxford, who was there to keep tabs on another D of E group who had camped the night before at Loch nan Eun and were heading this way. She had suggested to them they camp "further up the valley" which is I suppose the way you would put it, coming from Oxford. Her male counterpart came in briefly and was dispatched to fetch water. The three occupants of the plastic chairs seemed concerned at this turn of events. "Does that mean kids are coming here?". She (who wasn't offered the use of a plastic chair either) stood and explained the young people would be camping in tents but not to worry, they were very nice. It would have been interesting to have stayed longer to observe the dynamics of that night with the older gentleman who'd already claimed his space with his mattress, the two D of E supervisors and the three young guys with tents outside who seemed reluctant to relinqush their claim on three plastic chairs! Fascinating though it was we had to drag ourselves away and start the walk back to Linn of Dee. Having done Maoile Lunndaidh and Seana Bhraigh in the past few weeks I was used to the long haul but this was Moira's first Munro of the year and by Derry Lodge her feet were very sore. As she said being cheated of the views did detract from the day a bit - but she dug deep and it wasn't anything a hot shower and night's sleep wouldn't sort out. We thought of the folk in the bothy and all those keen D of E kids and were thankful we were heading home to comfy beds with a solid roof over our heads. I don't know where it was Queen Victoria is meant to have asked the question that elicited John Brown's euphemistic reply, but if she was looking at Bod an Deamhain from the Lairig Ghru near Corrour bothy I'm pretty sure she got there by horseback and not by walking! Last edited by dogplodder on Mon Jul 11, 2016 11:58 am, edited 1 time in total. hi Dogplodder. A real mega walk that. Enjoyed your description of the dynamics at the bothy and I think you should definitely put a bothy night on your todo list. Great report Kathleen with lovely photos as ever. Towser wrote: hi Dogplodder. A real mega walk that. Enjoyed your description of the dynamics at the bothy and I think you should definitely put a bothy night on your to do list. Imagine the report I could write after a whole night! 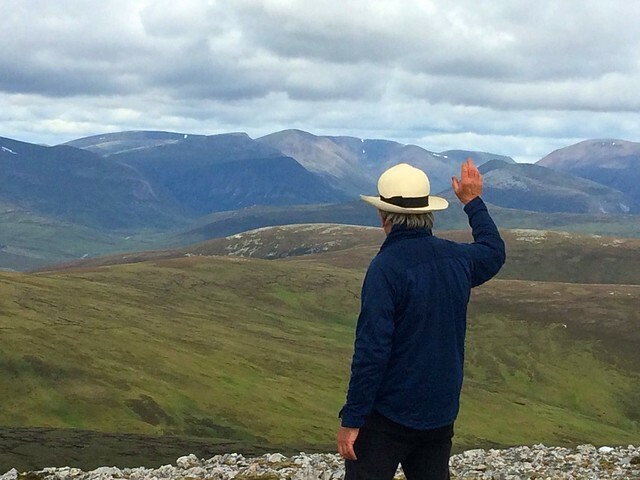 We waved at you from Carn Bhac - just in case you had the binoculars trained on Glen Ey. Ah, Corrour Bothy. You see it all in there! Ah bothys - always full of wierdos and entertainment - especially the Gorms ones The walk out from derry is always a killer - you could make a fortune hiring bikes out from the lodge to get hillwalkers back to the car park - could charge what you liked and folk would pay! What a trek, well done for walking in and out in one day! Good to see that the area is recovering from the fire. I haven't stayed in a bothy yet this year. Must make amends! pollyh33 wrote: Great report Kathleen with lovely photos as ever. To say they were rude or weirdos would be going too far.... just a bit gormless. Don't be put off going but make sure you have a tent as it can be busy - especially at weekends! Graeme D wrote: Ah, Corrour Bothy. You see it all in there! I'm sure YOU have, with all the times you've been there! basscadet wrote: Ah bothys - always full of wierdos and entertainment - especially the Gorms ones The walk out from derry is always a killer - you could make a fortune hiring bikes out from the lodge to get hillwalkers back to the car park - could charge what you liked and folk would pay! Now there's an idea for some enterprising soul. Silverhill wrote: Good to see that the area is recovering from the fire. Due to the wind it could have spread so much further but once the fire-fighters were there they contained it well and a casual observer might not even notice there's been a fire. Great walk and beautiful photos !